The goal in warm-mix asphalt (WMA) production is to lower temperatures, thus raise efficiency, while preparing the liquid asphalt cement (AC) to thoroughly coat aggregate in the mix. To that end, the team at CMI-Roadbuilding Inc., Oklahoma City, Oklahoma, offers its single-point injection WMA system, by which water and AC emulsion produce aggregate encapsulation at lower temperatures. Here’s how it works. A PLC-controlled system interfaces with the plant operating system to control the liquid AC-to-water mix ratio. A positive displacement water pump, with 5 horsepower and variable frequency drive (VFD) capability, moves water from a 200-gallon tank, through a filter, to the patented mixing chamber. This does not require chemical additives. 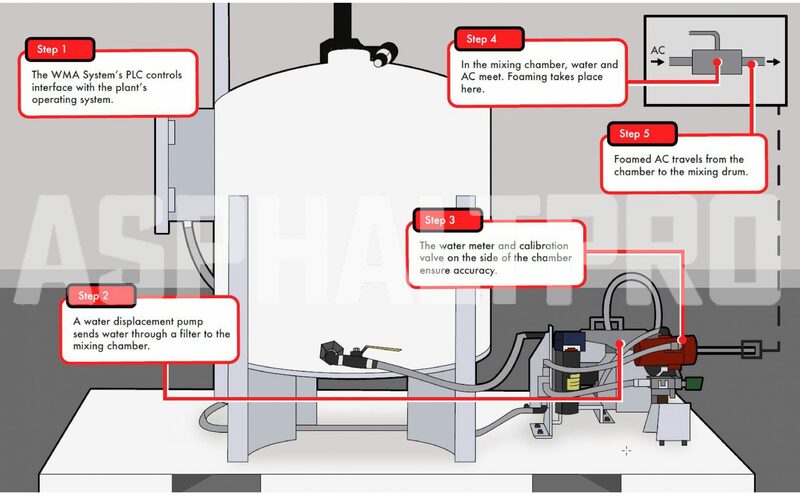 A water meter and calibration valve on the side of the chamber are designed to ensure mixing accuracy. Solenoid valves control the flow of water and prevent reverse flow of AC into the water line. In the mixing chamber, water and AC meet for foaming action. From the mixing chamber, the foamed AC travels into the mixing drum to coat aggregate. For more information, contact sales@cmi-roadbuilding.com.